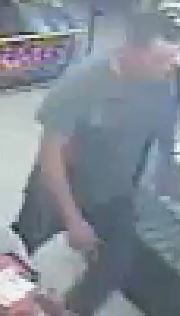 On July 31, 2016 at approximately 4:30 PM, a white male suspect reached across the counter and snatched a handful of cash from the register while the clerk was conducting a transaction at Dollar General, located at 1197 North Eastman Road in Kingsport. Anyone who recognizes this individual is asked to contact Detectives in the K.P.D. Criminal Investigations Division at 423-229-9429 or call Kingsport Central Dispatch at 423-246-9111.